"But even though it's been centuries now… In our hearts, none of us feels truly… Safe. I think, even if our people were to survive until the end of time itself, we would still fear… The return of the Daleks." What did you think? This one was a bit shorter, did that work better for this story? Does the Doctor always need a companion? Ok, this one was pretty cool in that it combined several stories. First, the Doctor crossed paths with the characters and events of Dalek Empire I & II and we revisit the events of 'Planet of the Daleks' and the Dalek army buried under molten ice there. It was definitely sort of fun to revisit the Spridons and get a moment of...nope we haven't forgotten about that army buried under ice! I liked that it was a little shorter, it really worked for the story. Overall, a lot of fun and interesting to see a couple previous stories intersect. This was fun. Just an hour of tying up loose ends over decades of Doctor Who. This is the sort of thing that I love from the show. Moffat does that every once in awhile like explaining the temporal grace in the TARDIS. "That was just a clever lie to save my life!" It didn't really create a full story, but it had a lot of fun stuff. 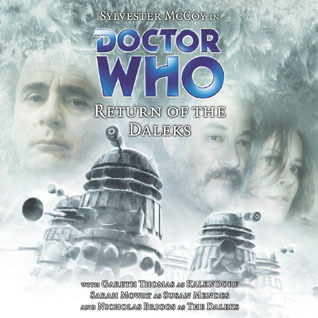 The Seventh Doctor was the perfect one to be part of this story because he's so mysterious. I didn't even the story was going to be like this until Kalendorf showed up in the very beginning. Good times.